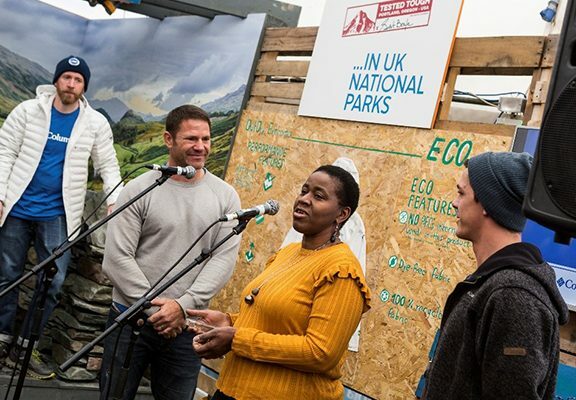 Above: Last year, the Peak District Mosaic Project won the Group category: Yvonne Witter, who chairs the group, received the award from presenter Steve Backshall at the Kendal Mountain Festival. The annual awards celebrate the hard work and commitment of people who regularly dedicate thousands of hours of service and effort to help protect Britain’s 15 national parks. Every year in the Peak District alone, some 400 National Park volunteer rangers clock up around 60,000 hours to care for the landscape and help others enjoy the area, and conservation volunteers spend around 3,000 days enhancing sites. Volunteers also take part in activities with the Moors for the Future Partnership and assist the Peak District National Park Authority in outreach activities, surveys and more. Dave Cramp, who organizes the conservation volunteers for the Peak District National Park, said: “The awards recognise people’s efforts who have gone above and beyond the usual expectations of voluntary service in looking after the environment or our heritage in some way. “I am very proud to say our volunteers have won these awards in the past and we know incredible work is being achieved by volunteers throughout the National Park. It would be fantastic to see more awards this year to celebrate what they do. • 2017 – the Peak District Mosaic Project. • 2015 – the Fit for Work Project. • 2013 – volunteer National Park rangers’ Health Walks. • 2013 – Chamu Kuppuswamy won the individual award for encouraging minority ethnic communities in Sheffield to visit the Peak District. There are four categories – Individual, Young Person (25 years and below), Group and Project. To be eligible to enter, the voluntary service or project must take place within the boundaries of one of the UK’s 15 National Parks. The activity does not have to have been organised by the National Park Authority – many individuals and community groups take part in local voluntary activities from making well dressings to restoring dewponds. To nominate a deserving individual, young person, group, or project and to find out how to volunteer yourself visit: http://www.nationalparks.gov.uk/volunteerawards2018. Nominations are being accepted until 12 noon on Friday September 21, 2018. The group and project winners will receive a £1,000 bursary towards their future volunteering efforts. The individual and young person winners will receive outdoor kit from UK National Parks partner Columbia Sportswear. The 2018 National Parks UK Volunteer Awards are supported by Columbia Sportswear. Picture caption: Last year, the Peak District Mosaic Project won the Group category: Yvonne Witter, who chairs the group, received the award from presenter Steve Backshall at the Kendal Mountain Festival.